Visual Tactile Cast Microfinish Surface Roughness Comparator - provides industry with established flat surface roughness specimens for visual and tactual comparison of surfaces produced by casting manufacturing operations. It is used in specifying and controlling surface roughness when a product having the appearance of typically as-cast surfaces required. The Microfinish Comparator provides an economical tool which permits roughness to be specified on the same basis as linear measurements. 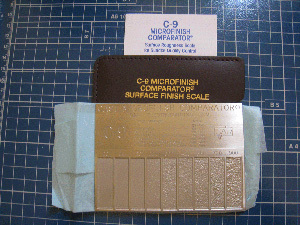 The Cast Microfinish Comparator is rectangular in shape (4 1/2"x 3 1/4") and is a corrosion resistant electroformed nickel duplicate of actual cast surfaces. There are nine replicated cast surface finish specimens ranging from 20 to 900 microinches. The Cast Microfinish Comparator is supplied in a leatherette case with engineering data and instructions. The Cast Microfinish Comparator is also available in metric with micrometer designations. The Cast Surface Roughness Scale provides an economical tool which permits roughness to be specified on the same basis as linear measurements. Details covering this subject are now published in The American National Standards Institute (ANSI) specification titled: "Surface Texture, Surface Roughness, Waviness and Lay". ANSI/ASME B46.1 Surface Roughness Scale is made by a dual electroforming process wherein nickel is electrodeposited to provide an exact reproduction in intricate detail. The surfaces used in this scale are reproductions of accurately turned surfaces measured in microinches (millionths of an inch- 0.000001"). The numbers engraved alongside each surface are the average deviation from the mean surface expressed in microinches. This comparator is simple to use - Place the Cast Microfinish Comparator Surface Roughness Scale alongside your work piece. Slide the scale so that the rectangle with the surface roughness you want is adjacent to the piece you are examining. Compare by drawing the tip of the fingernail across each surface at right angles to the tool mark. The feel of the fingernail contact must be the same if the finishes are identical.